New Delhi: Finance minister P. Chidambaram couldn’t have been more spot-on when he spoke this week about what’s hurting the insurance industry’s growth in India. “In my view, the reason why insurance is stumbling in India is because of mis-selling of products and complex products," Chidambaram said in a public speech on Monday, reported by PTI. “If you want to sell insurance to India, you must sell simple products and must make it absolutely clear to agents and other officers that they should not mis-sell." Policyholders in urban India, where few buyers of insurance can claim they don’t have a rip-off story to tell, would know exactly what Chidambaram meant. It’s a phenomenon that goes back to the first decade of privatization, when an around three-million-strong sales force, which took home up to 40% of the first-year premium as commission, sold life insurance products that were built like investor traps. Complicit in this were life insurance companies that stood to benefit because of very high surrender charges (charges levied by the insurers when an investor stops paying premiums midway), as investors let policies lapse when they discovered that the policies were unsuitable. According to a Goldman Sachs report, profits from the lapsed policies were enough not only to wipe out losses in some companies, but actually show profits at the aggregate. The other group to benefit was the sellers of these products—agency commissions for the period 2004-05 to 2011-12 totalled ₹ 1.13 trillion. The mis-selling of life insurance products in the decade after the 2000 privatization is a textbook case of poor regulation and mis-managing the transition from a state monopoly to free markets. So big became the public uproar over the predatory sales of life insurance products that the regulator, in July 2010, was forced to step in and change the rules around the product being mis-sold—the unit-linked insurance plan (Ulip). But the damage had been done. 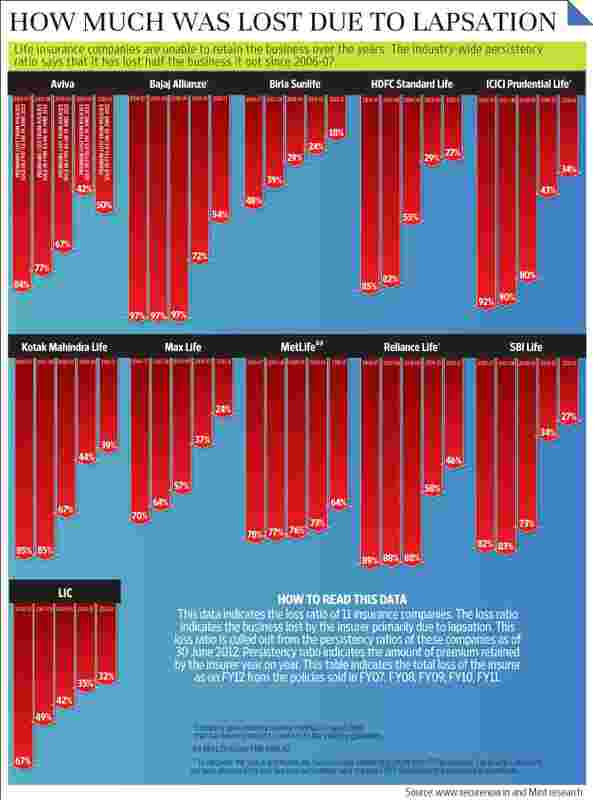 Ulips, almost single handedly, have caused a deep erosion of investors’ money and confidence in the markets. Mint, over a period of three months, has carried out its own research and the number we have is astounding. We know now that more than ₹ 1.56 trillion has leaked out of the industry because of investors letting their policies lapse over a seven-year period ending 2011-12. The actual loss is likely to be a multiple of that. When the insurance industry started on the road to privatization in 2000, little did we know that the seeds of large-scale investor fraud were being sown in the rules of the game. To understand why insurance was mis-sold so blatantly in the post-privatization period, we need to understand the product structure and the incentives embedded in it. Till the private sector introduced Ulip in 2002, the life insurance industry in India had only what are called traditional or non-linked plans. A non-linked plan must be looked at as a recurring deposit with a sliver of life insurance included. A typical policy had a funding period of 10-15 years with an endowment corpus at the end, with average annual return rates of a tax-free 3-4%. The product was sold by an army of around 3 million agents, who worked in their local communities and sold life insurance as a safe way to target future corpuses. With the final benefit fixed and a government guarantee, there was little risk for the small investor. But this changed once the industry opened up to the private sector. Three things happened. One, Ulip was introduced. Two, the traditional agent had suddenly many more work options and could move from company to company. Three, a new channel—national-level corporate agents and banks—came into the market whose regulation fell between the cracks. Ulips are market-linked insurance policies that let the investor choose where the money gets invested—in stocks, bonds or a combination of the two. It would not be incorrect to call a Ulip a mutual fund with a thin crust of life insurance. Though the best life insurance policy is a term plan that has no investment embedded but just carries a risk premium, what the industry sells are the investment-heavy bundled products such as traditional endowment plans and Ulips. These are meant to be long-term products that have a life of between 10 years and 15 years, with a pay-in of between five years and 15 years. Insurance rules allow life insurance policies to be “front loaded", enabling them to push most of the annual sales commission (over 10-15 years) in the first-year premium. First-year commissions (the money taken from the premium paid by the investor and given by the insurance firm to the sales agent as an incentive for getting the business) go as high as 40% (in practice, life insurance companies were paying more than this using various heads under which they could pay the intermediaries) in the first year; commissions go down to 7.5% in years 2 and 3, and then drop to 5% by year 4 and remain constant thereafter. Regulation also allowed a lock-in of the money for three years after which the investor could stop paying the premium and surrender the policy. But if the investor did not fund the policy in the first few years, rules allowed insurance firms to deduct up to 100% of the value left, after the commission and other costs. That’s right. If the investor stopped paying the premium, rules allowed the firm to return nothing to him in the first few years of a policy. And even after the lock-in was over, high surrender charges ensured that investors got very little money back if they stopped paying premiums. The regulator has taken note of this feature and Irda’s fiscal year 2008 annual report says: “In case of lapse of a policy in the first few years, all or most of the premiums paid are usually forfeited by the insurer and the policyholder ends up losing whatever premiums have already been paid towards the policy." Value in front-loaded policies begins to build up, and that too if the markets do well, only after seven-eight years. But, of course, most agents did not tell this to the investor at the time of the sale. The reason that mis-selling took root after the introduction of Ulip is this: the traditional policy was sold as a 15-year corpus-building plan by the agent; however, Ulip was sold as a three-year money-doubling plan. The sellers did not tell the investors that they needed to keep funding policies every year for 10-15 years for them to benefit. Investors, prepped by agents, bought equity-linked Ulips thinking they were buying a three-year product that would double their money. But when they looked at their account statements at the time of the second or the third premium, they realized almost all their money had got deducted in costs. Those expecting double the money at the end of year 3 found their fund value to be less than half of the total money they had invested. Policy deaths occurred at these annual investor reviews when people realized they’d been cheated. “It is true, policies were sold for three years when they should have been sold for a long term. It was almost like a race to the top; sales guys took over the business. This was compounded by a regulatory regime that also focused on first-year premium and not on persistency," said Deepak M. Satwalekar, former managing director (MD) and chief executive officer (CEO) of HDFC Standard Life Insurance Co. Ltd.
That there was a problem with the Ulip product in particular has been established by Irda itself. In July 2010, the regulator changed the rules of the game around Ulip and took away the most toxic features that allowed mis-selling. The rules for the non-linked plans will change before the end of the current fiscal. Future investors will not be defrauded the way early investors into Ulips were, but we need to estimate the scale of the mis-selling and quantify how much they lost. We use two methods to measure this loss for the period 2004-05 to 2011-12. So why did these premiums not come back? Premiums in a regular paying policy can stop returning to the policy for four reasons. One, policies that mature and the maturity benefit gets paid out. Two, the insured dies and the death benefit is paid out to the beneficiary. Three, policies are unfunded due to an income shock to the insured. Four, policies that lapse due to the insured discovering a product-financial need mismatch and stopping the funding of the policy. To double check our numbers, we used another method to get hold of the premium leakage in the industry. The second method for calculating premium loss is to look at the persistency ratios of insurers. Persistency ratio is the percentage of policies still in force after sale and is measured in defined intervals. The regulator defines it thus: “Persistency is about understanding how many life insurance policies have been issued to customers and out of these how many customers continue to regularly pay premiums on dates as per the terms set out in the policy contract." A 13th month persistency ratio would indicate the percentage of insurance business still in force or renewed a year after the policy was sold. If the first-year premium for regular policies was ₹ 1,000 and the persistency ratio was 80% in the 13th month, ₹ 800 would come back to the insurer as renewal premium; ₹ 200 was lost. The calculation of persistency ratio automatically excludes loss in premium due to death or maturity. A 25th month persistency ratio would indicate the percentage of business in force after two years, 37th month after three years, 49th after four years and 61st month would indicate the business in force after five years. A 25% persistency ratio for the 61st month would mean that the policies that were issued five years ago lost three quarters of premium over five years. The persistency ratio is a published number and is available in the public disclosure document of all the companies. Mint sourced the data from securenow.in, an insurance broking firm. Using company data for 11 firms that make up more than 90% of the business and have been in operation for more than 10 years, we crunched numbers to see the industry-wide loss of premium. These 11 companies lost around ₹ 1.27 trillion in the last six years. Both methods give a number that should be read as the minimum loss faced by the investor. The actual losses will be much higher. This is because both methods count the leakage in premium in a particular year. 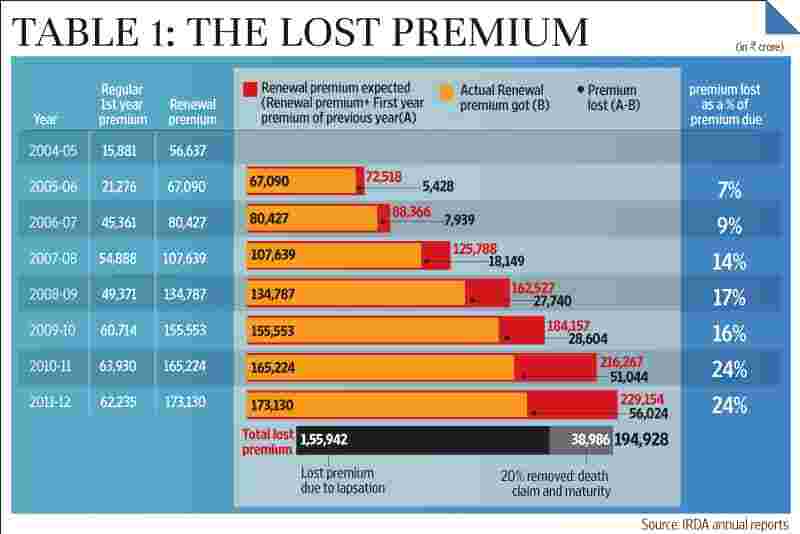 For the investor who stops paying the premium, the unfunded policy could be more than one year old and his loss is the sum of premiums paid before he let the policy lapse or surrendered the policy. For example: an investor buys a policy in year 0, but does not fund it in year 1. The company does not get his second-year premium in year 1, but appropriates the entire premium of year 0, post-commissions, due to the 100% surrender charges allowed. Suppose the investor funds the policy in year 1, but stops funding it in year 2. Now the insurance company will show a loss of premium in year 3, but for the investor the loss is premium of year 0 plus premium of year 1 since the company was allowed to keep back the entire premium of a lapsed policy. If the premium was ₹ 100, the company will show a loss of renewal premium of ₹ 100, but for the investor, the loss will be ₹ 200 (premium lost of year 0 and year 1). “It is quite difficult to arrive at an estimate on how much policyholders lost due to lapses. 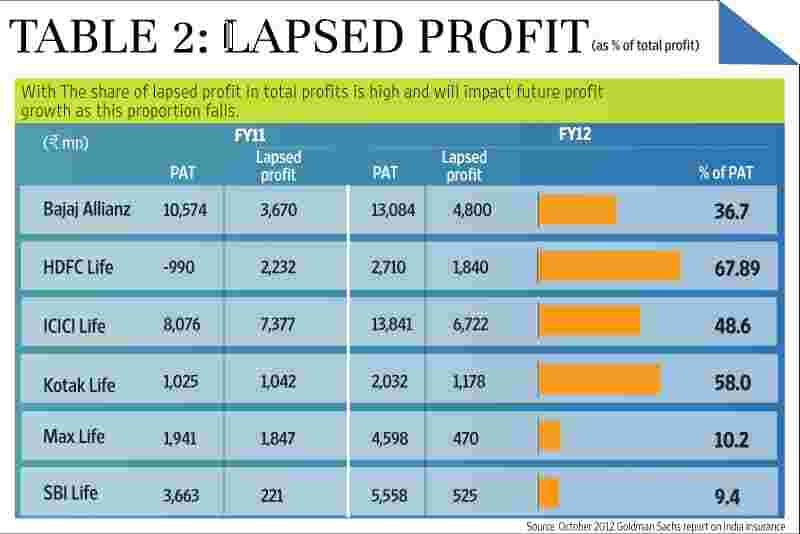 However, since penalties in the pre-2010 Ulips were severe and charges were front-loaded, the loss to customers is likely to be higher than the insurer’s losses due to lapses," said Kapil Mehta, former MD and CEO of DLF Pramerica Life Insurance Co. Ltd, and director of securenow.in. Both the methods above count the loss of premium to the insurance company and that becomes the investor’s loss multiplied by the premiums he has paid. A cross-section of the industry we spoke to laid blame on three factors. One, the customers chose to stop paying premiums after three years because of policy flexibility. Said Amitabh Chaudhry, MD and CEO of HDFC Standard Life Insurance Co.: “The premium persistency in Ulips is low due to the feature available on these contracts, wherein the customer can stop paying premiums after three years and still stay invested in the chosen funds and also enjoy insurance protection." But surely, even this points to mis-selling by the agent who sold insurance as a short-term product. Ulips until 2010 were heavily front-loaded and, therefore, in the initial stages, the premiums paid costs and very little got invested. A Ulip would begin to show a positive return (if the markets did well) only after seven or eight years. It is unfair for the industry to blame the policyholder when the product structure and the sales process were at fault. Instead of asking policyholders to invest every year for a long term, the agent used the flexibility option to sell it as if it were a three-year product. Two, investors expectations of short-term gains caused lapsation. “Ulips are seen as products with short-term gains. In case the returns are not in line with their expectations, they tend to move out of the policy. Since 2008, the Indian stock markets have witnessed significant volatility, regulatory environment in life insurance has been dynamic and Indian economic conditions have also changed. This led to a fundamental shift in customer preference to traditional, guaranteed products," said the MD and CEO of a large insurance company who did not want to be named. Not all insurers agree with this view. “Commissions in Ulips are capped, but that’s not the case with traditional plans. I don’t think customers feel that Ulips are risky and traditional plans are better. I feel they are being sold traditional plans. We have experienced that with the same incentive to sell both plans, what gets sold or chosen is Ulips," said P. Nandagopal, MD and CEO of IndiaFirst Life Insurance Co. Ltd.
Third, insurers say that the rapid pace of regulatory change caused people to let policies lapse. “The view that regulatory reform has led to increased lapsation is perverse. The design of Ulip products particularly raises many issues and hence the authority, in September 2010, brought out guidelines on Ulip product design and on surrenders with a view to improve the then prevailing products for the benefit of the policyholder. The rates of lapsation have come down since the regulatory reform and hence regulatory changes have not ushered in any decrease in persistency, but, on the contrary, have contributed significantly to its enhancement," said Irda chairman J. Hari Narayan in an interview with Mint on 4 June 2012. No surprises here, the biggest gainers in the great Indian insurance rip-off were the agents, banks, corporate sellers and the insurance companies themselves. Between the producer and the seller, all the money of the people who fell into the trap and decided to stop funding their policies was appropriated. The total commissions paid out over the period totalled ₹ 1.13 trillion, or almost 71% of the amount lost. Most of the rest will be found in the profit and loss accounts of the insurance companies. Insurance rules before September 2010 allowed insurance companies to keep the lapsed money. After holding the money in a special reserve, this money becomes part of the profit and loss account. Estimates by an October 2012 Goldman Sachs global investment research report for just six companies show lapsation profits of ₹ 3,189 crore for two years ending 2011-12. “It is quite unfortunate that insurers took this money to their profit and loss statement. The money that insurers got from surrender charge should have gone into policyholder’s fund and used for policyholder protection," said Satwalekar, former head of HDFC Standard Life. From fishermen in coastal India who thought they were putting the money in a bank to small farmers in the hills up north, to mass affluent educated people like you and me. And the government wonders why we, silly retail investors, run to gold.